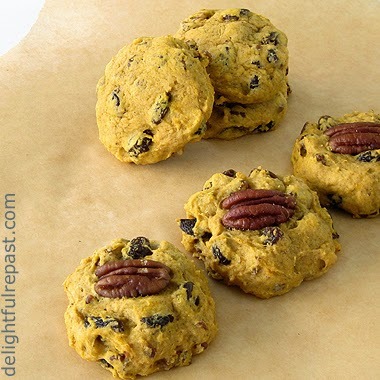 Pumpkin pecan cookies are an autumn favorite. I just love the spicy scents wafting around the kitchen as they bake. Funny, but I rarely make anything with pumpkin during spring or summer. Funny because I prefer to use canned pumpkin, which is available year round. I buy organic pumpkin in 15-ounce cans, which hold 1 3/4 cups. I absolutely hate waste (My Grandma would be so proud! ), so if a recipe calls for anything less than the whole can I have to have two recipes lined up to use it all. So when I make my Steamed Pumpkin Pudding that calls for 3/4 cup, I also make this cookie recipe that calls for the remaining cup. Granted, these may not be the most photogenic cookies, but they are "healthy" cookies, having less sugar and fat than typical cookies. The raisins are naturally sweet and the spices add an illusion of sweetness, so you won't feel deprived that each large cookie has just a teaspoon of sugar. 1 Preheat oven to 350 degrees (375 if using insulated cookie sheet). In small bowl, whisk together flour, baking soda, salt and spices. 2 In medium bowl, cream butter and sugar; add egg, then pumpkin puree, then dry ingredients. Stir in nuts and raisins. 3 Drop by #40 scoopfuls (about 1 1/2 tablespoons) onto cookie sheet that has been greased or lined with parchment paper. Flatten scoops of dough a bit unless you like a spherical cookie. Bake 12 to 15 minutes. Cool on wire rack. I love pumpkin and spicy things you can do with a can of pumpkin. And pecans are my favorite for baking. This just HAS TO BE yummy. Thanks, Anni! AND with just a teaspoon of sugar and less than a teaspoon of butter, I feel good about it when I find myself having a couple of them for breakfast! Hi Jean, These sound delicious and I like the fact that they contain less sugar. Thanks for your sweet comment on my post today. Mildred, thanks! And "sweet" nothing -- make some money with tha "gorge"ous photo! Great idea for using up the pumpkin...I usually have some left over from recipes as well. Thanks, Linda! I get really upset with myself when I waste food. Thanks, Judy! Feel free to leave out the raisins, but how about some dried cranberries? These look great! I bought some pumpkin and raisins this morning to make these. Can't wait to taste them. Nicole, thank you! I hope you like them as much as we do! Richard, that is soooo cool! Be sure to let me know how they turn out. A sweet treat I can eat... and have all to myself since no one else here likes pumpkin! Good suggestion on the cranberry suggestion, think I'll give it a go. Jacqueline, I thought of you when I posted this! And how your dear husband will leave them all for you! They sound interesting to try! I'm generally not into healthy cookies, but if they have pecans they must be worth sampling! LOL Bethany, I'm not into healthy *anything* unless it's also wonderful apart from that! For me, a food has to be both! Canned pumpkin puree ain't available over here, so I can only get them during autumn..now the season is over and you don't see them any more. Luckily I stored a couple of them in the cellar. Your pumpkin pecan biscuits look so comforting and irresistible! Angie, thank you. And how clever of you to store a few cans of pumpkin for when it's not available. Years ago friends from England were visiting and wanted my pumpkin pie recipe and a few cans of pumpkin to take home because it wasn't available there (at least then). Once again you have created an eye feast I cannot resist! That said – and as much as I love pumpkin pie – the idea of pumpkin-anything but pie puts my taste buds in defensive mode (not pie ala mode). Must be the resemblance to yellow squash, a taste of which once curdled my tongue all the way down to the roots. Or maybe it’s a prohibition against things yellow, on account of I love snow, e.g. 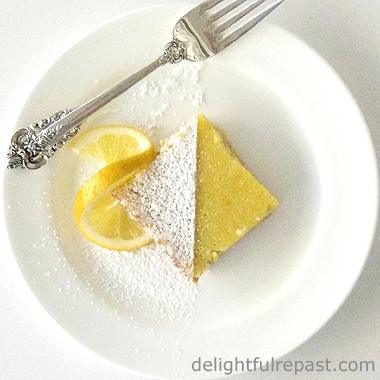 “don’t eat yellow snow.” But then…my all-time favorite food is lemon meringue pie. Yellow lemon meringue pie. No, this is not to be reasoned out. Purely reflex. I shall steal the pecans from your visual feast across the border into chewable delights, however. Thanks, Sully! And most people's food aversions can't be reasoned out, but we all have them! Amy, thanks! Yes, I recommend them! I did make these cookies on Thursday and they were great! I handed a few out to friends and everyone loved them. Thanks Jean! Richard, thank you so much - I'm so glad you liked them! Thank you so much, Karen! I do love cooking with the seasons, even when it's not a matter of availability (as with canned pumpkin). wow, these look so good. Thanks, BJ. They make a great snack while waiting for the pie to cool, too! Ohhhhhh. If I were there, Pat, I'd bring you a nice pot of tea and a plate of these cookies and maybe a cozy little throw to warm you up! Get well soon. Now, Greg, I appreciate the comment, but I happen to know you are *very* photogenic!